Do you have that one item of clothing you wear constantly and never goes out of fashion? I do. 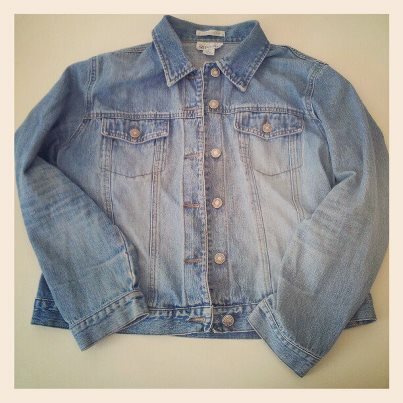 My essential item is my Sussan denim jacket (in Melbourne, you can never have enough jackets or cardigans!). I bought my denim jacket at Sussan, Camberwell on a Thursday night after work in July, 2000. I remember the day because I had just moved back to Melbourne from Brisbane and I was getting my tax done at H & R Block in Camberwell that evening. I was early for my appointment, so decided I would do some shopping to fill in time. Hello, new clothing from Sussan. Personally, I blame my tax man. Hmmm I wonder if I could have claimed it as a tax deduction?!? The below jacket is the current denim jacket from Sussan. Like most classic pieces, choose a style, colour and cut which won’t date. It hasn’t changed much in twelve years has it? So how do I style my denim jacket? A denim jacket can be worn in all seasons. I am going to show you some looks for Spring and Summer. Love this look from Reece Witherspoon. Cute dress, Tote bag, sunnies and hat. Perfect for weekend wear. Nicole Ritchie with her denim jacket over a maxi dress. Another cute look is to wear your demin jacket over a tee shirt and maxi skirt. I have a navy and white stripe skirt from Forever New and wear it with a plain navy tee from Sussan with my denim jacket over the top. Add cute ballet flats and you are good to go! I really love this look. Such a smart look, everything just ties in together. Even the heels. White jeans are a key item this Spring/Summer and look fantastic with a denim jacket. You could try other coloured jeans like, green, coral, pink, orange, red, light green or other pastel colours around at the moment. Easy Mummy wear from Jessica Alba. Cute ballet flats and matching tote bag, three quarter length pants, simple top and denim jacket. Smart but casual. Love a long white shirt with a denim jacket. Miranda Kerr looks great in three quarter length pants. Boots for a cooler day. Denim jackets also look fantastic over tunic tops. Kourtney K and Mason love their denim. Again cute ballet flats, a long tee and denim jacket finishes a casual look. Love the leopard print bag. Or you could be like Delta and dress down a little black dress. Love the bling and tote bag! You do realise that you can snag a George Clooney while wearing a denim jacket, don’t you? You didn’t? Well… what are you waiting for? Go put it on… now! Next Post Supergirl Clothing. Win a clothing pack..